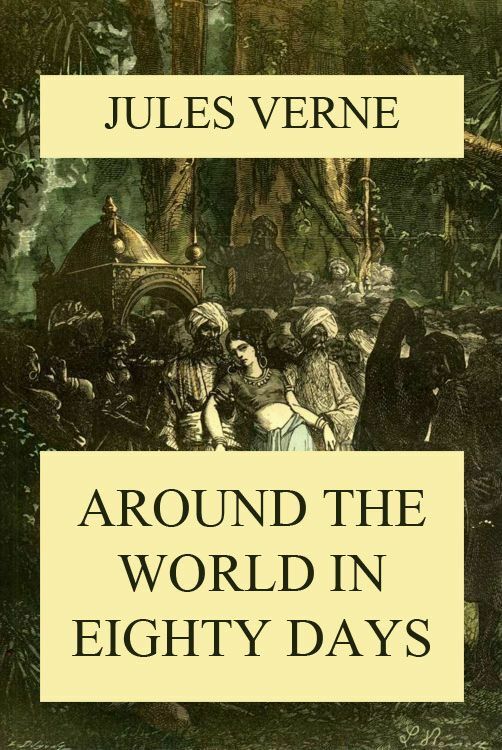 Phileas Fogg, a respectable English gentleman of phlegmatic temperament and methodical habits, maintains, during a discussion at his club in London, that a man can travel around the world in eighty days; and to prove it, he makes a wager of half his fortune that he can do it himself in that time. The bet is accepted, and he starts the same night, taking his French servant Passepartout with him. He wins his wager, after a series of adventures in which nature, man, accident, and the novelist combine to defeat him, but are all baffled by his unfailing resource, iron will, invincible coolness, and Napoleonic readiness to sacrifice everything else to the one essential point;—everything except humanity, in whose behalf he twice risks defeat, first to save from suttee the beautiful young Hindoo widow Aouda, and second to save Passepartout from murder by a Chinese mob. His virtue is rewarded by success and Aouda. At the Reform Club, Fogg gets involved in an argument over an article in The Daily Telegraph stating that with the opening of a new railway section in India, it is now possible to travel around the world in 80 days. He accepts a wager for £20,000 (£2,075,400 in 2017) from his fellow club members to complete such a journey within this time period. With Monsieur Passepartout accompanying him, Fogg departs from London by train at 8:45 p.m. on 2 October; if he is to win the wager, then he will have to return to the club by this same time on 21 December, 80 days later. Fogg and Passepartout reach Suez in time. While disembarking in Egypt, they are watched by a Scotland Yard detective, Detective Fix, who has been dispatched from London in search of a bank robber. Since Fogg answers the vague description Scotland Yard was given of the robber, Detective Fix mistakes Fogg for the criminal. Since he cannot secure a warrant in time, Fix boards the steamer (the Mongolia) conveying the travelers to Bombay. Fix becomes acquainted with Passepartout without revealing his purpose. Fogg promises the steamer engineer a large reward if he gets them to Bombay early. They dock two days ahead of schedule. After reaching India they take a train from Bombay to Calcutta. Fogg learns that the Daily Telegraph article was wrong – the railroad actually ends at Kholby and starts again, 50 miles further on, near Allahabad, Fogg purchases an elephant, hires a guide, and starts toward Allahabad. They come across a procession in which a young Indian woman, Aouda, is to undergo sati. Since the young woman is drugged with opium and hemp and is obviously not going voluntarily, the travelers decide to rescue her. They follow the procession to the site, where Passepartout takes the place of Aouda’s deceased husband on the funeral pyre on which she is to be burned. During the ceremony he rises from the pyre, scaring off the priests, and carries the young woman away. The twelve hours gained earlier are lost, but Fogg shows no regret. In Hong Kong, it turns out that Aouda’s distant relative, in whose care they had been planning to leave her, has moved to Holland, so they decide to take her with them to Europe. Still without a warrant, Fix sees Hong Kong as his last chance to arrest Fogg on British soil. Passepartout becomes convinced that Fix is a spy from the Reform Club. Fix confides in Passepartout, who does not believe a word and remains convinced that his master is not a bank robber. To prevent Passepartout from informing his master about the premature departure of their next vessel, the Carnatic, Fix gets Passepartout drunk and drugs him in an opium den. Passepartout still manages to catch the steamer to Yokohama, but neglects to inform Fogg that the steamer is leaving the evening before its scheduled departure date. Fogg discovers that he missed his connection. He searches for a vessel that will take him to Yokohama, finding a pilot boat, the Tankadere, that takes him and Aouda to Shanghai, where they catch a steamer to Yokohama. In Yokohama, they search for Passepartout, believing that he may have arrived there on the Carnatic as originally planned. They find him in a circus, trying to earn the fare for his homeward journey. Reunited, the four board a paddle-steamer, the General Grant, taking them across the Pacific to San Francisco. Fix promises Passepartout that now, having left British soil, he will no longer try to delay Fogg’s journey, but instead support him in getting back to Britain so he can arrest Fogg in Britain itself. In San Francisco they board a transcontinental train to New York, encountering a number of obstacles along the way: a massive herd of bison crossing the tracks, a failing suspension bridge, and the train being attacked by Siouxwarriors. After uncoupling the locomotive from the carriages, Passepartout is kidnapped by the Indians, but Fogg rescues him after American soldiers volunteer to help. They continue by a wind powered sledge to Omaha, where they get a train to New York. In New York, having missed the sailing of their ship, the China, Fogg starts looking for an alternative to cross the Atlantic Ocean. He finds a steamboat, the Henrietta, destined for Bordeaux, France. The captain of the boat refuses to take the company to Liverpool, whereupon Fogg consents to be taken to Bordeaux for $2,000 (£207,540 in 2017) per passenger. He then bribes the crew to mutiny and make course for Liverpool. Against hurricane winds and going on full steam, the boat runs out of fuel after a few days. Fogg buys the boat from the captain and has the crew burn all the wooden parts to keep up the steam. The following day Fogg apologises to Aouda for bringing her with him, since he now has to live in poverty and cannot support her. Aouda confesses that she loves him and asks him to marry her. As Passepartout notifies a minister, he learns that he is mistaken in the date – it is not 22 December, but instead 21 December. Because the party had travelled eastward, they gained one day upon crossing the International Date Line. Passepartout informs Fogg of his mistake, and Fogg hurries to the Reform Club just in time to meet his deadline and win the wager. Having already spent the bulk of the £20,000 during the journey, he divides the remaining money between Passepartout and Fix and marries Aouda. This narrative gives a mistaken impression of the ending. For the trip, Fogg took £20,000, in cash, in a suitcase, amounting to half of his fortune at the time. The other half of his fortune, the other £20,000 was to be held in escrow at the bank to pay off his wager if he lost, the men on the other side of the bet, similarly put £20,000 to be held during the wager. Much of what Fogg took with him was spent during the trip, as detailed above. Before the date was discovered, Fogg confessed to Aouda that he was now poor, but she wanted to marry him anyway, as set out above. When the true date was discovered, as above, Fogg collected the £20,000 wagered – and his £20,000 that was held in escrow, restoring him to his original fortune of £40,000, distributing the remaining balance of his „travel money“.